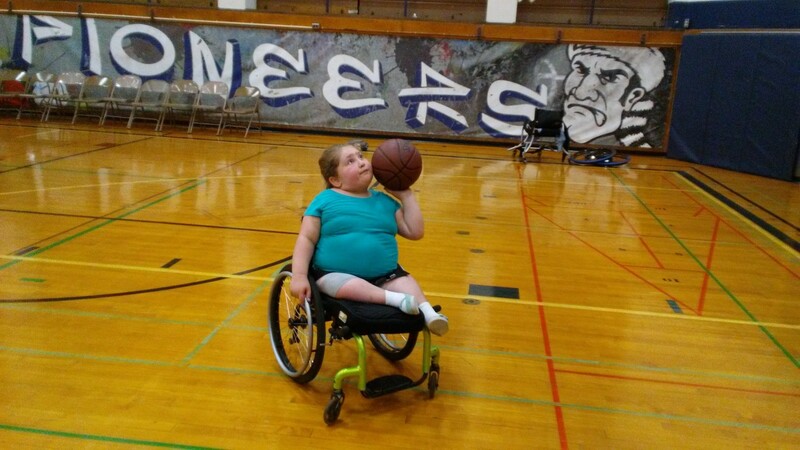 Instead of transferring into a sports wheelchair, Namine stayed in her own this time. This was primarily for dribbling practice, since the sports chair’s wheels are slanted. Namine may be faster in the other wheelchair, but she’s still getting stronger and faster, regardless of which one she’s in. She did strength exercises — where she pulled her coach across the gym — and speed exercises — where she raced her coach. Namine has also been working on her basketball shots. The basics, as her coach would say, are key. So for now, she’s encouraged to take her time. Line up her elbow. Focus on treating her arm like a spring. She’s off to a great start.